"Early designs linked wings directly to the suspension, but several accidents led to rules stating that wings must be fixed rigidly to the chassis." Does this mean that there is an intrinsic advantage in mounting wings to the suspension? What would that advantage be? (obviously leaving the safety aspects aside for the sake of argument). The "body" would not stay at a constant height as the suspension moves, and the increase in downforce would take up all the suspension travel. Better to have the force constant on the wheels and allow the "body" to have movement. Does this mean that there is an intrinsic advantage in mounting wings to the suspension? What would that advantage be? The text you quoted says "linked wings", not "mounted wings". To me, "linked wings" means suspension travel would cause wings to move/rotate, changing their angle of attack or similar. High downforce from wings acting directly on the suspension would prevent the suspension from operating correctly or not at all, when forced against its limit/stops. In racing, everything is driven towards maximizing the tire contact patch and giving it as much traction as possible. Aerodynamic devices add downforce with little added mass. So logically, more downforce = more grip. And the early attempts dealt with it directly, vector the downforce directly to the tires by connecting the wings to the suspension uprights. The benefits are that the chassis and it's required suspension geometry and action are isolated from the downforce. Because (as in the present system) with a wing pushing down on the body and the body pushing down on the suspension, tuning the suspension becomes very complicated and the chassis rides very harshly. The benefits of attaching the wings directly to the suspension uprights is that the chassis can be tuned just for mechanical grip without being concerned about aero loads on the suspension. Additionally, the ride in this system is less harsh, giving the driver and all chassis components a smoother and less harsh ride. The downside is that any bumps in the track surface are transferred directly to the wing struts and wings, leading to the increased possibility of failure. 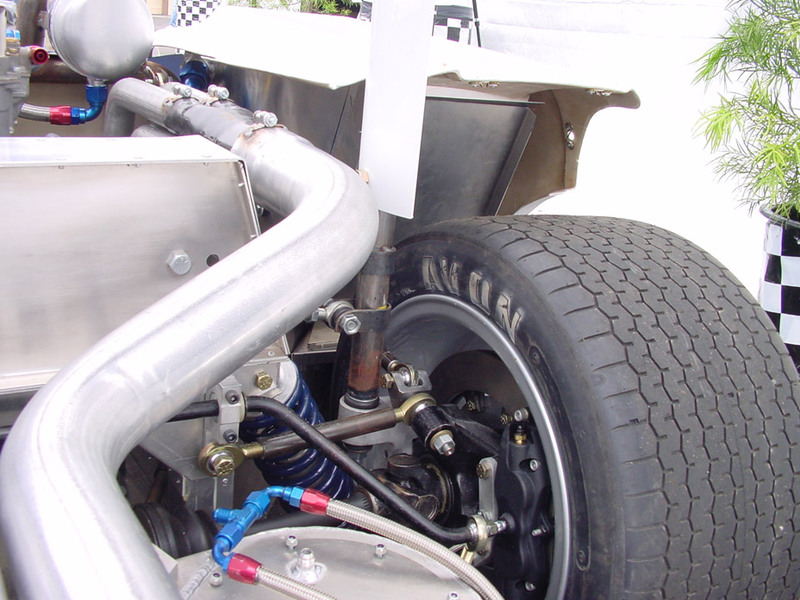 In the photos below the Chaparral 2J has a rear wing attached directly to the suspension uprights. The advantage of "mounting" the wings directly to the suspension, outboard of the springs (which is what I've interpreted from the OP), is that the downforce generated by the wing(s) is translated directly to the wheels rather than being absorbed by the suspension. 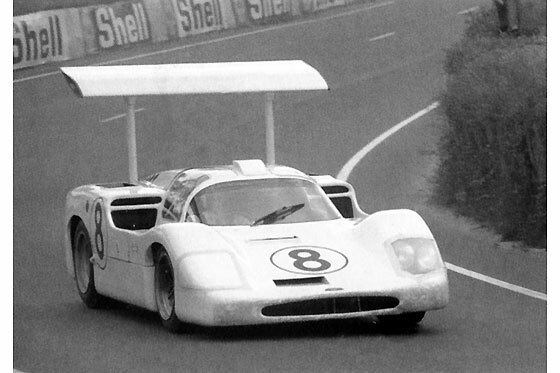 Furthermore, the angle of the wing, relative to the road, remains constant, even on banking and/or off-cambered corners. This means that the ride height of the wings can be maintained. Now, while this might not be significant for a wing that's already a metre or so off the ground, it's very important if the aerodynamic device is only 60mm off the ground. This is what Colin Chapman was getting at with the Lotus 88 (look it up anywhere if you're not familiar with it). This is effectively a car with a chassis that houses the monocoque, driver, the engine and has sprung suspension. But, rather cleverly, it has a wing which envelopes the whole chassis and is mounted not on the chassis but directly to the wheel hubs. What this does is produce a car with a venturi tunnel that's attached like a single wing to the wheels (like in the OP's question). The ride height of this wing is then maintained at a constant height above the ground while the rest of the car can bounce around absorbing shocks and saving the driver and engine from vibration. The airflow under the car is then controlled and there is less probability of the suction breaking away with changes to ride height.